■ Upcoming Updates to PvP! We would like to inform you of the following upcoming updates to PvP Mode. ・Silver Tickets will be obtainable from new weekly missions. ・New missions will be visible in the "Limited" tab under Missions. The above changes will take effect starting Sep. 18, 2018! We thank you for your feedback and understanding as we continue to make adjustments to PvP Mode. Key Art #18 VIP Quests Pt.2 & More! The Gold Ticket will be distributed on Sep. 25, 2018 at 2:00 a.m. (PT) / Sep. 25, 2018 at 9:00 (UTC). *Offer expires on Sep. 23, 2018 at 11:59 p.m. (PT) / Sep. 24, 2018 at 6:59 (UTC). Key Art #18 VIP Quests are here again for this week's special VIP deal! 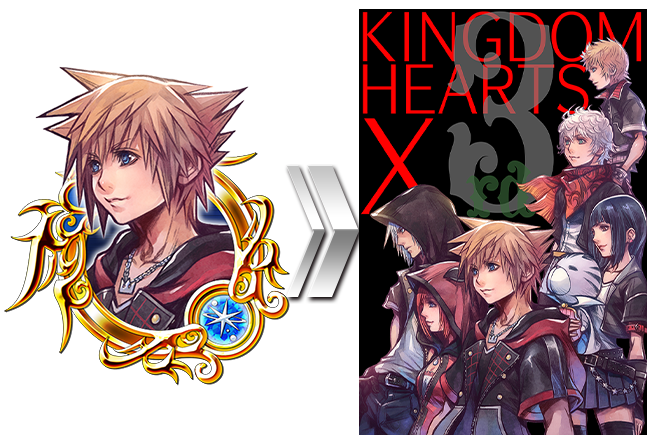 Key Art #18 has special artwork that you can view from the Medal details page! Hercules, Megara, and Hades Avatar Boards Return! ★ Greek it out in the Underworld with these Returning Avatar Boards! 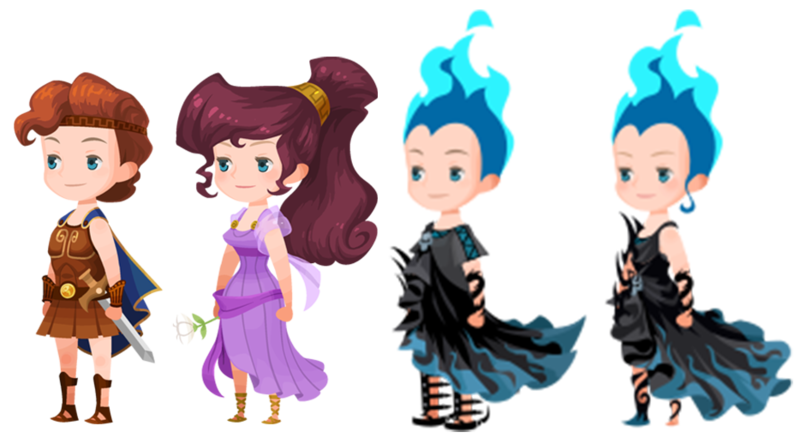 Your favorite characters from Hercules are back and available for 1500 Jewels apiece! 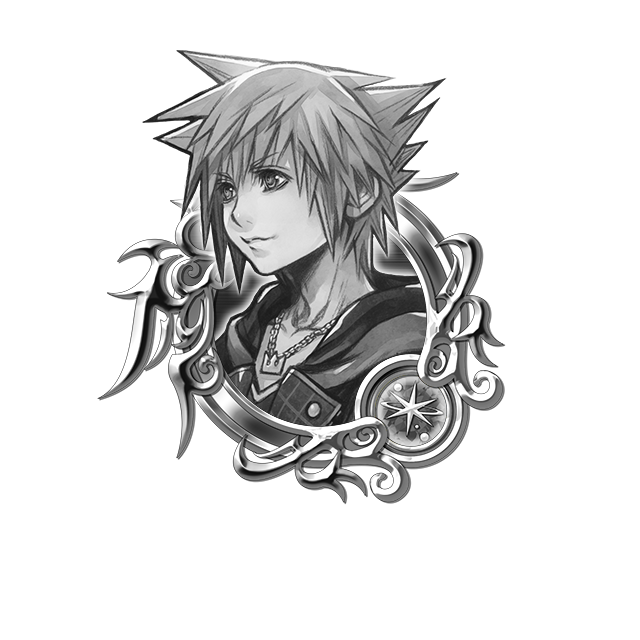 Each board includes a set of avatar parts, boost Medals (including three Magic Broom Medals! ), a Magic Gem, plus a trio of useful skills! ★ The mighty villain, Sephiroth, has appeared...! Defeat him with No Continues and obtain the One-Winged title! The Keyblade Wielders run into Cloud, whose face wears a grim expression. What troublesome fate awaits our heroes...? A total of 12 quests will be made available during this event. Complete objectives to receive rewards, like the Huey & Dewey & Louie EXP Medal and more! Additionally, by defeating Sephiroth with no continues, you can obtain the One-Winged title! Starlight Sunglasses & Starlight Booster Union Cross! ★ Get the Starlight Sunglasses Avatar and Spirit Parts, and special Starlight Boosters! This time there are a total of 8 Cross Boards, 6 of which will be unlocked from the start (Magic Broom Set #2 and Magic Mirror Set #2 will unlock sequentially as follows below). Complete them to earn the new Avatar and Spirit Parts, three Starlight Boosters, Jewels, and more! Starlight Sunglasses (Male) Chat Phrase: Perfect! Starlight Sunglasses (Female) Chat Phrase: Got this! Starlight Sunglasses (Spirit Part) Chat Phrase: Cool outfit! You can obtain Starlight Boosters from this event, which will temporarily strengthen slots one through five on your Starlight Keyblade! *Starlight Boosters obtained from this event will expire on Sep. 30, 2018 at 11:59 p.m. (PT) / Oct. 1, 2018 6:59 (UTC). Defeat the Gear Golem Raid Boss with your party members to earn Raid Coins, which you can use to get fabulous rewards, including Magic Broom, Magic Mirror, Chip, and Dale Medals ! The Raid Board for this Raid Event will be available until Sep. 24, 2018 11:59 a.m. (PT) / Sep. 24, 2018 18:59 (UTC). On Saturday and Sunday, the Raid Boss will be available all day, until the event ends on Sep. 23, 2018 11:59 p.m. (PT) / Sep. 24, 2018 6:59 (UTC)! ・Gain an increased 2 levels upon successful defeat of the boss! ■ Compete with other players in the new Swiftstriker Championship Event! We're introducing a new competition, the Swiftstriker Championship! During the event, 3 quests will be available. Clear these quests as quickly as you can! Each quest features enemies of different attributes, but the difficulty of all three quests are the same. Furthermore, your fastest recorded time is shared between all three quests. You only need to focus on doing well in one of the three, so take advantage of the quest you're strong against and give it your all! *The time counter will appear on the bottom right corner of the screen after clearing the quest. 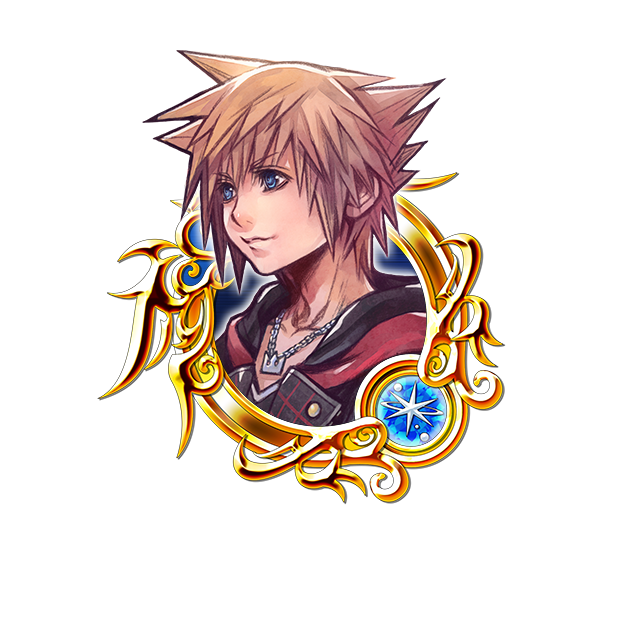 The players who place in the top 5 ranks at the end of the event will receive a special title for their rank! Rewards will be sent out to players after the event period has ended. If there are multiple players in a rank, all players within the rank will receive the title. The ticker on the HOME page will display the current top ranking players in this event between 12:00 a.m. and 4:00 a.m. (PT) / 7:00 to 11:00 (UTC) each day from Sep. 18 to Sep. 21, so keep an eye out to see if you’ve made the cut! Do you have what it takes to place in the Top 5?